I just received a question in an email, “Should i tithe before or after taxes”. It’s a good question. Even though there are many other difficult questions in regards to tithing, many people have been confused for some time about whether they should tithe on the gross or net. Everything seemed pretty cut and dry with Israel in the Bible, but it doesn’t seem that way with us since so much has changed with the New Testament Church. First, we don’t have Levites and priests. Second, we don’t have a temple, or storehouses. We don’t even have the Mosaic law. On top of that, we’ve been given some new things. We now have the Holy Spirit and are under grace. We are also under a new covenant. We are born again, and one of God’s sons. This list of changes from the Old Testament into the New Testament is a nightmare to weed through. Should i tithe on the benefits of my health insurance? Should i tithe on car insurance claims? Is tithing before or after taxes? Can i tithe to a charity? Can i tithe to friends and family? Those who have a heart towards God will seek obedience. So i understand why they questions in regards to the tithing command. But Godly Stewardship is not in the letter, it is of the heart and in the Spirit. Some may see fit to include a 10% requirement within the spirit of the law, but when confronted about whether 10% is a reflection of their heart, they answer, “No”. If a 10% commitment is not a reflection of their heart then how can it be within the spirit of the law? The point is that all these questions about tithing show how 10% giving is a part of the letter and not of the spirit. The regulations about what you can give, who you can give to, how much you can give, when and where; are all part of the letter that kills. if you don’t think it kills, just look at how people stumble over 1 tithing question. Let alone, a hundred more that the bible doesn’t even give you answers for; because the instructions for tithing were given under the Old Covenant. With Spirit led giving in the New Testament, the command to tithe is overwritten and fulfilled. If the law was fulfilled, that means its purpose is used up. You cannot continue to use and add more water to a bucket of water when it has fulfilled its purpose. It is full and finished with its job. It is not abolished. It is just fulfilled. Now, you need a different bucket that allows you to fill up with more water. Thank God for Spirit-led giving in its place. I found the link to this article from Yahoo Tithing group. I love this article; especially the last paragraph. thanks for stopping by. It took me a long time for my little pea brain to come up with the bucket of water analogy. Good good stuff, well said. Keep up the great work! If the members tithe from the gross income the Pastor and his family can go for luxury vactions 5 times a year but if they tithe from net income the Pastor and his family take only 3 luxury vactions! I realy are confused of giving tenth or should the ould testament be thrown away.Why are their then a ould testament IF IT IS THEN FULLFILLED BY THE CROSS OF JESUS.THE GOD HAVY IS THE SAME AS 6THOUSEND YEARS AGO.i want to obey GOD that is why i want to be specific.Father GOD JESUS AND THE HOLY SPIRIT.PLEAS ANSWER ME. So, I take it since you didn’t actually answer the question, you are leaving it up to the person to decide? I was thinking about when you wrote all those other options out, some of them would be dependent on pre- or post- tax tithing. If you tithe on your gross, you are tithing on the money that is taken out for retirement, social security, 401K, (possibly even car insurance or health insurance benefits), etc. so why would you tithe on it again just because you received a check from it. Now, if you tithe on your net, it would make sense to tithe when you receive checks from these benefits. Of course, it’s hard to tithe on car insurance and Health benefits when they don’t ever actually hand you the money. The Bible says tithe off your first-fruits, which is money you have physically worked for and earned. But then, what are your firstfruits? Does that include money you don’t even get to use because it’s taken away from you before you even see your check? Gifts can be tricky. The person who gave the monetary gift to you (if a Christian) may have already tithed on that money. How many times do you tithe on money that has been tithed on? But then, there is the side, God allowed you to get that gift so you recognize God’s hand in providing something special for you. Definitely an interesting subject. Personally, I tithe on gross income. But that’s just me. I’m not really sure if net tithing would be wrong or not. .-= Robert Burke´s last blog ..Project updates =-. To keep the law according to the old covenant you cant just keep one law and ignore the other 600 Mosiac law. Apostle Paul said, you need to keep the whole Mosiac law . We as christians have no right to enter the old covenant God had with Israel. Christians only came in after Jesus died on the cross. if thats the case what about the ten commandments ? also heres some food for thought , if we are to use jesus as our example , and jesus kept to mosaic law because he was raised jewish , then arent we also as christians who follow christs example suppose to follow mosaic law? I don’t believe that we are required to tithe anyway. If you read the post, you will see that i said the tithe is fulfilled. Tithing and following the Holy Spirit are not incompatible. We are under obligation to follow the law of tithing as well as to listen to promptings of the Holy Spirit. We receive blessings from each when we do so, as do those around us. For example, if I tithe my 10%, the church is able to operate, continue to teach the gospel, and share God’s word because of the money that I share. If I listen to the Holy Spirit and receive a prompting that my neighbor down the street doesn’t have enough groceries, I visit, and take the needed groceries. We have obligations in both regards. My friends and neighbors are blessed. I receive the blessings inherent in following the commandments, as well as an increased ability to follow the Spirit. In my experience we are to tithe,and give alms of the substance of things we have, and then everything is clean to us. I would go with what you make without being taxed first, it would never hurt to pay more. If a person’s reason for not paying with what they make before taxes is because, the money they make, makes certian things possible for them, to buy,or fund, and if that thing isn’t really pleasing to the Lord, then trying to justify not paying on one’s income before taxes, would be dishonest,and wrong. We are to give alms of such things as we have, I usually go with 10% Tithe, 10% Offering, & 10% Alms of whatever amount I believe I have, before, or after taxes. I encourage prayer,and openess towards God on the subject, he will direct you in the right way. We were set free from the Law, so we could establish the Law. Love is the furfillment of the Law, because if we love, we won’t kill someone we love, if we love, we will be faithful to them, if we love, we will not steal from them, if we love, we will respect them, if we love, we will treat them the way would have them treat us. The ritualistic ordinances of the Mosaic Law, aren’t a requirement because of the complete obediance of Jesus Christ. We are free from the obligations written in the Mosaic law, but not free to do wrong. Lying is wrong, Stealing is wrong, Sexual immorality is wrong, Killing is wrong, disrespecting parents is wrong. This is supposed to be all centered around the law of love. A lot of people error, when they hear, we are no longer under the law. They think we can do whatever we want, as long as love is the motive. The thing is God ordained the Apostle Paul, to instruct us on how we are free from the Law, to manifest the works of the Law, to be made righteous with God. The Holy Spirit now helps us live a pure,and Holy life in Christ. Motivated by pure love. A lot of people try to justify certain things, claiming it is because of love, when it contradicts what the Apostle instructed us as being appropriate. Like for example, people claim, Homosexuality, Fornication, and other related things as being lawful to perform, or do, as long as it is centered around love. This is a mistake, as it is against God’s image,and God’s way of love. God is love.. I do not believe that tithing is required under the new covenant, however there is nothing wrong with wanting to honour God with an offering of a tithe if you feel led to do so. But it must not be done out of compulsion, otherwise it becomes a burden. 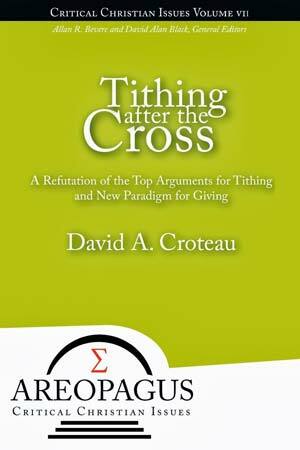 When debating tithing off gross or net, remember that an offering is acceptable to God based on what you have, not what you dont have, therefore you should give an offering of a tithe based on net, what you bring in, since taxes and etc’s will probably take up 25-50% of your gross depending on your tax bracket. Otherwise we can get real religious (or religulous), trying to figure out tithe amounts of gifts, and should or shouldnt I tithe on social security since it is already tithed on (how stupid can we actually get with this stuff)? Since NT believers arent required to tithe, a better way to honour God might be with a first fruits offering, Im debating/contemplating giving God the entire first paycheck of any new job I get, however big or small it might be, and seeing what He will do. I’m grateful I found this post and other comments. I’m not biblically versed as many who have posted here, and do not think I could add much to the conversations. I truly came to this post/blog with questions about a formula, and realize that the formula does not exist. Everyone’s posts have got me thinking in a different, more complete way, and I appreciate it. I don’t know what I’ll continue to tithe (gross or net) and I know that it is my battle within me, and nothing else. Good to know. The answer to the question that propelled me to this website is yet to be answered. The dilemma as to whether tithe should be pre or post tax remains. I have been tithing on my net or take home income – what I get after “Uncle Sam”, medical insurance and other mandated deductions (no 401K / 403B) are made. I also tithe on my Tax Returns and gifts. I wish someone will be categorical in stating what we as Born Again Christians should base our tithe on; 10% of pre or post taxes???? I will keep praying and asking the Holy Ghost for guidance and direction on this important matter. My take on tithing is this: Back in the day when people farmed, raised cattle, etc., they gave as they prospered. If at the end of the year they made money, they tithed 10 percent. If they made no money, they tithed nothing. In those days, they were also taxed whether they made anything or not. At the end of 7 years if they owed anybody, the debts were forgiven (thus, modern day bankruptsy). Also, back in the day, churches took care of widows and orphans and poor people and they took all their extra food, etc. to the church store house to take care of their members. Today, welfare has taken over the job of the church when it comes to taking care of the widows and orphans and the poor people. Churches don’t do their job anymore…let’s face the facts. So, back in the day, people gave as they prospered and the church took care of those that didn’t. Since welfare came about, this is where the church and state messed everything up. The “state” took over the churches job. Now, when people work all their lives, we assume that they gave their tithing to the church and when they retire, they have already paid taxes and tithes on that money and it’s all theirs now…none should go to the church. It would be different if the church took care of them in their old age and if your church happens to be one of the few that does right, then by all means, tithe. Retirement money, 401k’s, Social Security, Railroad Retirement, Postal Retirement is money that has already been taxed. The Bible says to give to Ceasar what he wants then give a tithe. Ceasar means the government in this day and age. My personal opinion is this…since churches do not take care of the people they are supposed to, then follow your heart and give your tithes to the places that do take care of those who need taken care of. If you want to truly give to the Lord and give a tithe or offering, give it to a soup kitchen, give it to a family in need, give it to a family that has sickness and illness where the money is going to good use. I’ve had people tell me that if I give my money to someone other than the church, then the ones I give it to will know I gave it and that it didn’t come from the Lord and it doesn’t count. Well, I disagree. I do not believe in giving to a church who does not help a soul. Churches now have “poundings” where you take food to the church to help feed someone. I say they should already have a pantry there ready to give to those in need. The churches also have “singings” to help with those people who need money for funerals and to help pay expenses for people who travel to and from medical facilities and they also have “love offerings” for that same thing. To me, it’s not right to tithe 10% and do all that stuff too. I want to know that my tithes go for those things that people can use. I don’t feel like we should give 10% to a preacher to ride expensive cars and live in mansions. I would gladly give more than my 10% if I knew my church was truly helping those who need it. I give my money to places and people who I know need it. I’ll stuff it in an envelope and put it in their mailbox and they never know where it comes from. If more people did this, we’d have a better world. Follow your heart and do what you think is right. I believe we owe God everything we have. All we have belongs to Him and because I know this and feel this way, is why I do what I think He would do if He was on earth. Charity does begin at home. I don’t feel right giving 10% to my church when family members are naked or hungry…or friends and acquaintances for that matter. I have been suffering this internal battle along with others for a while now. I give what I can based on my expenses and bills and feeding my family , and most times it isn’t even close to 10% I am constantly in prayer for guidance, and I still haven’t had an out loud response from God, though I do believe he speaks to me about some other issues I’m not being obedient with. But in the past couple of weeks I’ve been learning about obedience and hearing God’s voice.. and I have learned that if you truly seek him, he will reveal himself. In the end, God wants us to be broken of our own will so that we can live by his will. When you pray and ask for guidance on matters like this, you will either hear one of three internal voices. Make no mistake, it’s only one actual voice which is your internal mind voice like when you think things through and go back and forth inside your head and so on…. I’m not crazy hearing voices… lol. But the three voices I am talking about are just three thoughts that are distinctively different. There will be yourself saying, “Ok God, please tell me why I should do this, and what I should do” Then you’ll hear two responses. One will be a pro and the other a con. “You should do this because of this reason….” and “you should not do this because of this reason”. Now this doesn’t necessarily mean God is going to cover the con while your spiritual enemy will be the con. Sometimes it’s the other way around. But understand this… If it is God speaking, you will know because his words will stretch you. You’ll be so afraid, and resistant of what you’re being told, while your spiritual enemy is against you having a relationship or blessing from God… so what he’ll say whatever you want to hear to rationalize in your mind why you should or should not do something. For example… “God, should I tithe on my gross or net income?” Response #1 “Well, the tithe is the first 10th of your harvest right? Have there not always been taxes in the land?” “The tithe isn’t about my needing your money..it’s about your willingness to give back to me what I have given to you”. response #2 “you don’t actually earn your tax money, and you have to pay your medical and social security, and then after that, you have rent, and car payments, and ooooh the monthly electric is due this week and what are you gonna eat?” So you go to write your check and you want to write that larger amount down but you start to sweat and shake and your heart races… and you end up writing a smaller check or give nothing at all, and then you feel crappy all week and say, “next week I’ll give more”. So let me ask a question here. When it comes to doing anything we know we are to submit to God’s will and his will alone because we know he wants good things for us. Do you think God would intentionally put us in a position to go without if there was not a plan in place? Do you think he who knows and controls everything would say to you, “Give this amount…” and then after the fact, say, “Oh crap..I guess you’re screwed for the week on food… my bad” If you get two responses on that internal question, just ask yourself, would Satan, my spiritual enemy, and the father of lies ever tell me it was OK to give more money to God and not to worry because we serve a sovereign God? Okay, so here goes. I think tithing is a symbolic gesture that you show to say, “Hi God, John Doe here. You are the owner of all that I have and all that I am. It’s really hard for me to give this 10% to you, and I am sorry that I can’t give more. Please change my heart that I may be more generous towards the people who are in need. Please take this measly 10% of a broken, and wretched, and greedy man’s income as a symbol of your rule over my life, including my money. Whether it be 10% of my gross or my net, I am having a hard time letting this 10% go, but here goes anyways, for the purposes of your kingdom and for this church I serve.” There you have it; my humble take on this sensitive issue of money and the heart. What a thought provoking answer, Stay Free. We all fall short…most of us struggle(or have) with the tithe…the bills stack up…we know that the electric bill MUST be paid and there are way too many days until payday to give the grocery money up. But…we’re not hungry. We’re not cold. Every single time we give with a cheerful, grateful heart and ignore the voice of the enemy…just pick up the pen and write the check…for more than we are completely comfortable with…but all for His glory…it just comes back 10 fold! IT DOES! We’ve seen it. We believe it. Every time this happens I promise that I’ll never ever doubt again or think twice before I write that check…but I still do…every time. And He loves me in spite of it. Because He already knew that I would. Very provoking answer, Stay Free. I am battling this one today. I do not attend church but I support welfares that look after both humans and animals, I give more than 10% . I know this post is about after tax or before tax but I actually don’t know if I am tithing or not. Linda (above) explains that well about the government and church not doing their jobs, we, the civilians are. I believe God is within me, HE lives in me, I talk to HIM every day, HE guides me. I just don’t go to church. So if I were to tithe, where to? Do I take away the money that I donate to the organisations that are doing the churches work? I struggle with the questions you all have as indicated above in individual comments and thoughts. I’ve noticed the question mainly comes about when I am thinking about money as I obviously was when I googled the statement, “Should I tithe before or after tax.” As I wrote the previous sentence, the irony that I asked google and not God did present itself. When I give money and time to God I find I am not thinking about bills or other expenses. My prayers focus toward asking God to compel me toward his will. When I give money or time, I feel the compelling desire that I prayed for. Strange enough it really does feel like a separate voice saying, “Do it.” In that moment, I don’t think about any external factors, and allow the voice to take over my actions. Time on this earth to carry out Gods will is one thing, no matter how rich or poor, we all have. I would say it is the only thing that holds any real value in this world. We all want it and yet we never feel we have enough of it. It is the one thing that can be tied to any and every goal we have for ourselves. Want a new car? Want a nice home? Most important, (for most) want to be with your family more? You need time. What do we all associate with our time? Money. Both money and time are objects of worldly value. In heaven there is no time, only eternity. If God has not taken your time here on earth away, then what are you doing with it? Are you honoring him by giving of it whenever you can? My thought is that any time you stop providing time toward yourself in effort to help another you honor God through your giving. God knows that time on this earth is associated with money and he wants us to give both. So, on the topic of tithes, give. When the spirit of giving time or money compels you, do so. Continue to pray and ask God to provide you with the ability to give in ways that honor Him. God provides. Do not give with any expectations, that is not the point of giving. My philosophy on this subject is that while I have knowledge that God will/does provide, he gave/provided me a brain. A brain to see opportunities, ideas, and challenges (yes challenges) to seize, embark upon, and learn from. God provides for us and it is not always going to be in the form of a check made out to cash. The above statements and questions reflect my current views of what God has revealed to me at this point in my walk with Him. I pray that what I have been compelled to write honors and draws us all closer to Him. Strive to honor God in all that you do. God gave us a brain to think and act upon what we know. So as it becomes apparent do God’s will. Here is my conclusion after coming here and debating the same thing. Think about what we are asking? Before tax or after tax? Are we really limiting God to pre or after tax? Do you think God doesn’t have the means to increase your income a thousand fold if he wanted too? We do as most of us heard before create our own image of God and make him smaller, when he is the sustainer of every single vibrating molecule in the universe. So as I was debating this I was thinking of giving after tax which felt comfortable to me, but didn’t feel right in my heart. After deciding to give pre tax I now feel at peace within my soul. It is still hard as a human to think of giving away $5,000-$10,000/yr for some people more or less depending on where we live. Because we get the selfish thoughts of ohh man what I could do with that extra $10,000. Get that new car, new house, nice family vacation, new gadget. Meanwhile that $10,000 could feed hundreds and thousands of kids with no food and water. I was Layed off from my job, and I never canceled my monthly giving to charities something in me just said to keep doing it. At the time I got the new job I also said I wil raise the giving after a month or two, before that happened I got Layed off. So God knew before hand and spoke to me to keep my giving the same. The point is he knows everything we need and everything we want, and will meet all of our needs plus more. Even as afraid as we all might be, I think $700/mo giving is insane to the regular unsaved world. We have to walk out in faith and know he will provide and is just testing our love for him and the rest of our needy brothers and sisters. Are we faithful with little? If not how can he ever give us much? I believe he will all bless those who give with a cheerful heart, as you have denied your flesh and your self for somebody else. Anyway I hope to one day be able to freely give thousands upon millions and hopefully billions cheerfully to his kingdom, if he so entrusts me with HIS money. Remember it’s HIS not ours, us saying no lord I can’t give you this because I want a new car is basically us stealing from him. It’s as if I ask you to store $20,000 for me and then I come back and ask for it, but you tell me no because well I needed to fix my roof, go on vacation, do some stuff I had in mind with it. Anyway pray and he will always lead us. I don’t know why so many Christians are still being so legalistic about giving to the church. Tithing is an OLD TESTAMENT LAW that was fulfilled on the cross, satisfied by the blood of the Lamb. Jesus wants your heart more than he wants your money. Give what you can give, and what you have decided in your heart to give, and give it CHEERFULLY.